Yeah, well, that was a long time ago and that was how my friend from Texas did it, so I thought it was okay, and that is the thing. The results were just “okay.” There was nothing really great about the enchiladas–they were just okay. Not good, certainly, as the canned sauce tasted tinny and somewhat flat and bland, but not bad, either, in that they were edible. So, a year or so ago, I got on a Mexican food kick, bought up all of Diana Kennedy’s books, even the ones that were out of print, dragged out some Rick Bayless, Mark Miller and Cheryl Alters and Bill Jameson’s books, and started studying up on the subject. And I realized that there was no real reason for me to be intimidated by Mexican food. I loved chiles, I knew from tomatoes, and sauce making had lost its fear factor after having gone through culinary school, and I had a Sumeet grinder, so I had no real excuse not to throw down and develop my very own enchiladas Colorado sauce. Colorado is the red sauce that you see on enchiladas that are not Tex-Mex in derivation; the Tex-Mex version relies on chile gravy for its saucy kick, which is a totally different beastie altogether. (Over the years, I have found that I prefer the flavors of New Mexico and Arizona to Texas, so my Mexican foods tend to be derived from those border states instead of the Tex-Mex that is more familiar to more of the country.) The main flavorings and coloring of the red Colorado sauce comes from dried chiles, though certainly tomatoes and sweet bell peppers play their part in my version as well. Which chiles do I use in my sauce, one might ask? Well, several, and the kind and amount change depending on my mood, what I have in the pantry, what filling I am using, and for whom I am cooking. 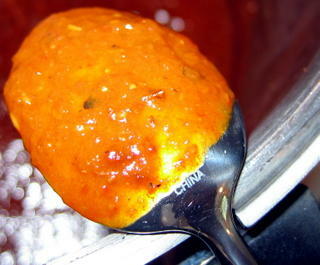 But three chiles are constants in this sauce: anchos, New Mexico reds and chipotles, either dried or en adobo. Anchos are the ripened, dried version of poblanos, which are the thick-walled, wide-shouldered green chiles that classic chile rellenos are made of. As you can see at the left, they are very wrinkly, and deep reddish to black in color, and vary in size from about two and a half inches long to three or four inches long, and half as wide. These give the characteristic brick-red color and soft heat to Colorado sauce. They are a rich cherry-red color, and are from three to six inches long, and fairly narrow. They are thinner-walled than the anchos, but they are still somewhat fleshy. They, too, should not be brittle, but should be pliable and somewhat leathery in texture for best flavor. Good ones smell sweet, but not as sticky-sweet as anchos, and there is definately a sharper, chile undertone that is unmistakeable. 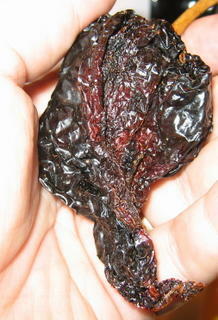 One good rule of thumb when it comes to buying dried chiles is to try and bend them and smell them. If they do not break easily, and you can smell them through the cellophane or plastic bag they are packed in, then they are good and fresh, and will make outstanding Colorado sauce. If they are brittle and break easily, then, you should probably pass on them and try another store where stock moves more quickly. Both Penzey’s and Badia put out good quality dried chiles, though Penzey’s is a good bit more expensive. Chile alhumado is the traditional chipotle; it is greyish tan, and is very heavily smoked. The morita (which means, “little blackberry” is the form most often sold in the US; it is blackish, softer and less smoked, so it has a milder smokey flavor. Moritas are generally considered inferior to chile alhumado, but that doesn’t mean that they are bad–they are still quite good-tasting and useful for cooking. For reference photographs and links to purchase either chile alhumado or moritas, look here. The brand of chipotle en adobo I have found most commonly in the US, and which I use, is La Morena. I find that the sauce is a useful addition to any number of bastes, rubs, salsas and condiments where I just want a touch of smoky heat, and the flavor of the chiles is full, round and not at all tinny. Before using the dried chiles to make a sauce, they must be toasted and soaked, then ground up. A lot of folks apparently skip the toasting part, but Diana Kennedy and Rick Bayless both insist that toasting brings out more of the flavors of the chile; having tried it both ways, I tend to agree with the experts. Toasting does deepen the flavors of the chiles, and in particular seems to bring out a lot more of the sweetness that lurks beneath the heat. Toasting them is a lot easier than one would think. 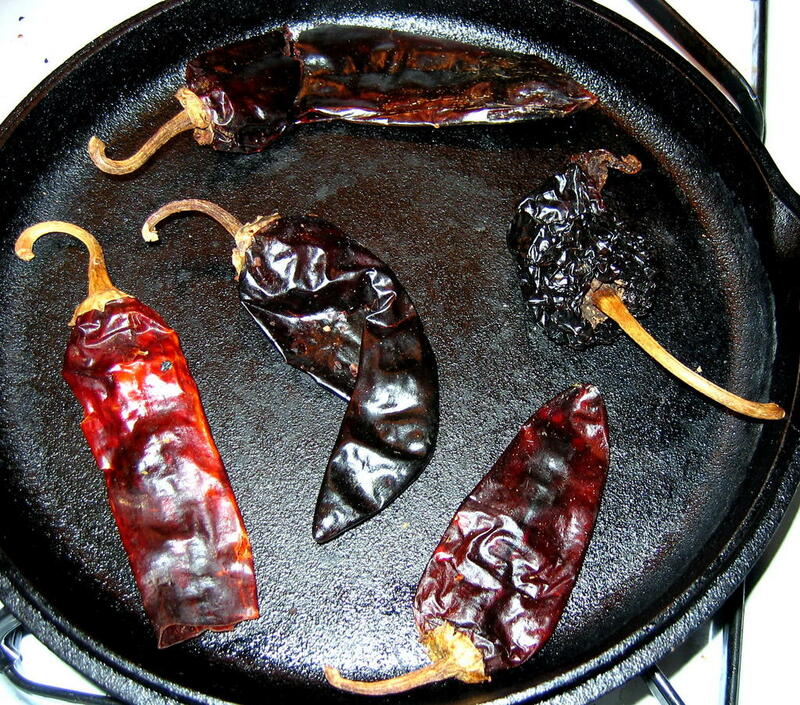 I use the flat cast iron griddle pan, which in Mexico is called a “comal,” put it on medium-high heat, get it hot, and lay the chiles in a single layer on it. Then, I watch them obsessively, and turn them frequently, until they just start to blacken a bit and smell really good. After that, I stick them all in a bowl, and add hot water just to cover them and let them soak until they are nice and soft. The soaking can take as long as an hour, particularly for the anchos, which are quite tough-skinned and leathery. Be patient–the longer you allow them to soak, the more easily they will be to grind later. At that point, I pop the stems off, and scrape out some of the seeds, and using my Sumeet Multi-Grind, I grind the squishy chiles, along with the chipotle en adobo into a nice, deep red smoky-sweet paste. (If you do not own a Sumeet, you can use a blender, but you must add a bit of the soaking water in order to get it to grind up well enough; if you cook a lot of Mexican, Thai and Indian food, however, I would suggest investing in a Sumeet.) At the same time as I grind the chiles, I grind toasted whole cumin, coriander and black peppercorns, along with onion and whole garlic cloves. The resulting thick, fragrant past is the backbone of the sauce. The body of the sauce is made with cooking stock and roasted vegetables. The stock is the braising liquid for the meat I will use for the filling. In this case, I used Pacific Natural Foods beef broth to which beer, roasted tomatoes, caramelized onions, whole chipotle chiles, bay leaves, a pinch of Mexican Oregano and roasted red bell peppers had been added. This particular stock had been used three different times to cook beef, and had been kept and frozen between uses. The first time I cooked beef in it, I used it in a shredded beef and rice casserole last summer. Then, it was thawed out a month or so ago when I felt the need to make enchiladas verde. After I shredded the beef for that recipe, I froze it one more time, and then thawed it out for its final run as a meat-cooking medium. Each time I used it, I added more roasted tomatoes, (I roast tomatoes the same way I roast tomatillos for enchiladas verde) more peppers and more chiles. When it cooked down, I added either more beef or vegetable broth, and often more beer. By this third time it has been used, the stock had become rich and slightly thick with suspended particles of beef and broken down vegetables, and was filled with the promise of making a good, strong sauce. But, as there were two quarts of the stock, and I only needed one quart of sauce, I began letting it reduce over medium heat, while on two of the other burners, I roasted sweet red bell peppers. 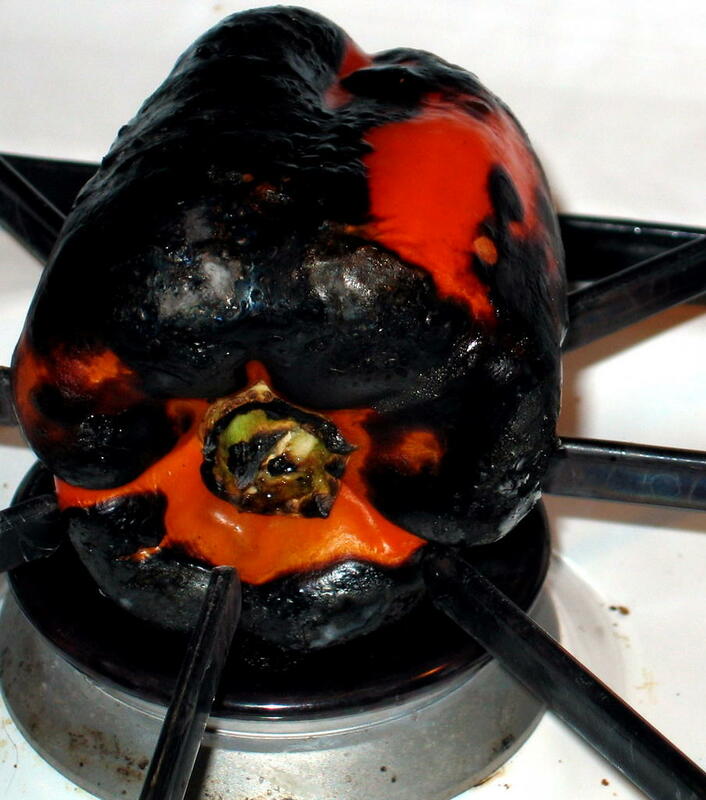 The process of fire roasting bell peppers is simple: set them on a gas flame, and turn them as they char. Keep doing this until the skins are completely blackened, then stick them in a bowl, cover them tightly with plastic wrap and allow them to steam. After they cool to room temperature, rub the skins off with your fingers, tear off the stems, and scrape out the seeds and placenta–the white pithy bits that hold the seeds. After the stock had reduced almost by half, I threw in the roasted red peppers, and the cup or so of chile, onion, garlic and spice paste, and stirring constantly, let the stock reduce until it was pretty much cooked down to half its original volume. At that point, the smell is incredible; the disparate ingredients danced together into a rich melange of scents: the chiles and sweet peppers took the lead, with the beef, cumin and coriander just behind. There was the slightest bitter medicinal tang of the Mexican oregano, while the tomatoes and bay leaves were perceptible only in the tiniest whiffs. Once that wonderful scent comes forth, it is time to break out the immersion blender and grind everything up into a thick, brick red sauce. 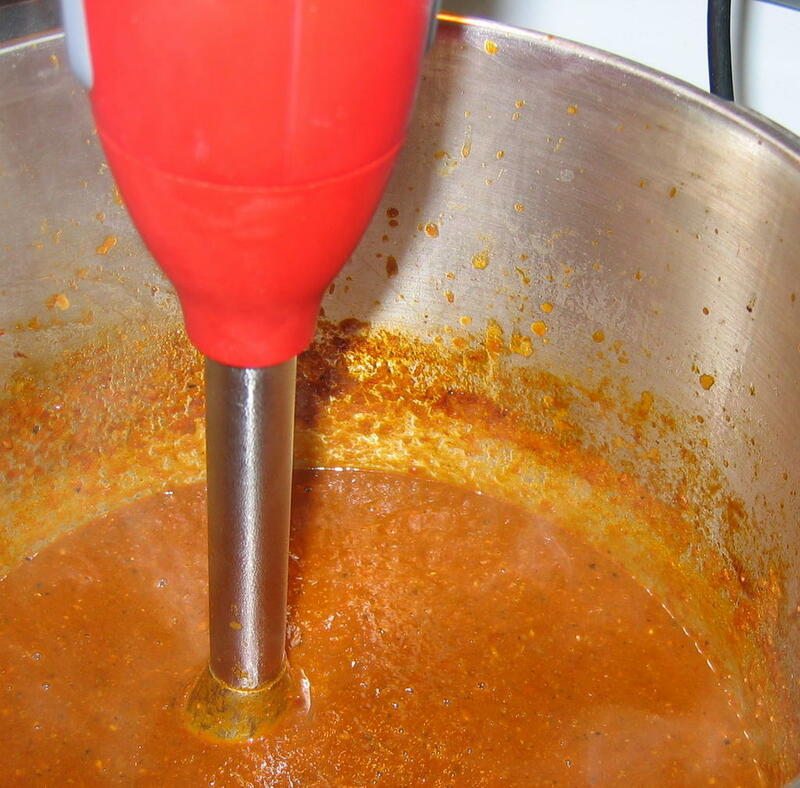 While running the blender, I leave the pot on the heat and allow the blender to stir it as I allow the sauce to reduce the final tiny bit; this ensures that while water boils away the sauce doesn’t scortch and stick to the bottom of the pot. It should be thick enough to coat the back of a spoon without dripping off immediately, as shown in the illustration above. I ended up with a tiny bit more than a quart of sauce, which is enough for about four huge pans of enchiladas. If that is more than is needed, it is no hardship to freeze the leftovers; in fact, that allows me to make enchiladas in the future without having to take the time and trouble of making sauce. Colorado sauce is useful not only for enchiladas, however. It goes beautifully with huevos rancheros–“eggs, ranch-style” a classic border dish of two corn tortillas topped with red sauce and two over easy eggs served with cheese and refried beans. Tamale filling of shredded pork or beef is enriched by the use of this sauce, or one could use it as the base of a quick chili–just add shredded meat and beans. At any rate, no matter what use one puts to it, this sauce beats the pants off of any jarred or canned enchilada sauce on the market, and if you have the appliances and the time, is well worth the effort of making. Bring stock to a boil on medium heat, and allow to simmer uncovered to reduce while you prepare the rest of the ingredients. Keep an eye on the stock and stir now and then to keep it from sticking to the bottom of the pot. Roast, skin and deseed the bell peppers as explained above. Cut into several pieces each. When the beef stock is reduced by half, add the bell pepper pieces and the chile paste, and stir constantly. 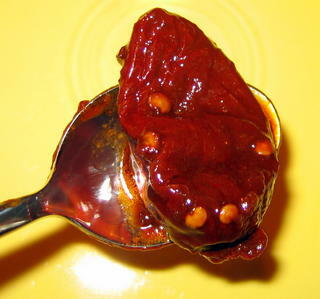 The chile paste will want to stick to itself, and will be difficult to dissolve into the stock. Keep working with it until the paste is evenly distributed into the simmering liquid. Turn the heat down, and allow to simmer, stirring constantly until the stock is reduced by half. 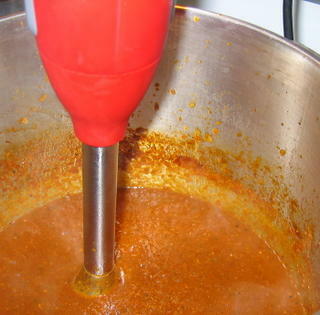 Using an immersion blender, puree the still simmering sauce, until it is completely smooth. Check consistency by dipping a table spoon into the sauce. If sauce coats the back of the spoon without sliding off easily, it is done. If it is still too thin, allow to reduce on the simmer further, stirring with the blender to keep the sauce from sticking. Add salt to taste, and either use sauce immediately, hold it over 140 degrees for service, or cool down and refrigerate or freeze for future use. Interesting that you used packaged broths/stock. I always thought that was major cheating because I never make my own. When you enrich it the first time, do you just let all the extra goodies simmer away for half an hour or so? Ladi, I am picky about commercial broths–I won’t use the canned ones, because they have a metallic aftertaste to me. But the aseptically packed Pacific foods brand has a good flavor. And yes, when I make the filling, I either use a pressure cooker, and let it cook a bit before or after the beef goes in. My second post will be about making the filling and will talk about enriching the broth into stock a bit. While I will make chicken stock at home–I really hate making beef stock. The smell as it first begins cooking is awful, and it gets into everything. Ugh. I made this tonight with vegetable broth instead of beef broth. Even before I added the paste, the stock had an incredible flavor and aroma. The cooking process was a little bit involved, but the end result is definitely worth it. The sauce is so bold and complex and amazing! Thanks very much for posting this recipe. GC, I am so glad to hear it that it turned out well for you. And yes, the cooking is a bit involved–which is why I don’t make enchiladas for every day, but for big dinners–the flavor is so much better than what you get by using bottled sauce, pre-made tortillas and indifferent fillings. That is one of the most in depth enchilada sauce deconstructions I have read on the web. Awesome. Thank you–I do try to do as detailed posts as possible, especially for foods or techniques which are not necessarily familiar to many readers.